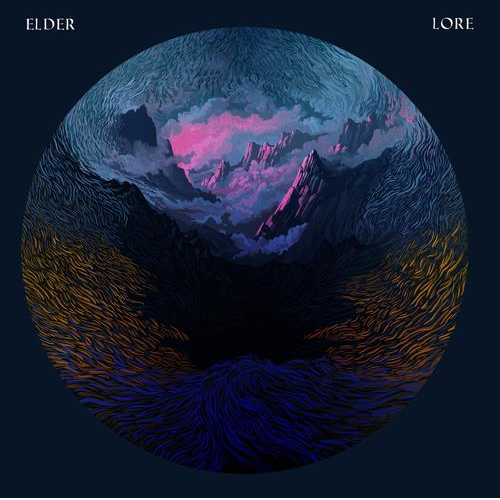 Elder is a stoner doom metal band from Massachusetts that consists of three members: guitarist/vocalist/keyboardist Nick DiSalvo, bassist Jack Donovan, and drummer Matt Couto. The three of them forged a soundscape that allowed me to escape from reality with the massive songs they crafted on Lore. There are indeed only five tracks on the record in total, by the gargantuan length of each of them results in an album that clocks in at 59 minutes. Every moment is absolutely jam packed with some of the thickest doom riffs the human mind can conjure up with extremely competent song writing to boot. Every one of the tracks on Lore showcases the band’s ability to create riffs, leads and rhythms with the ability to entrance. The tracks lured me in one by one by letting the riffs soak in through slow pacing and well-implemented repetition – exactly what a doom band should do. A perfect sample of what makes Lore as engaging as it is, is demonstrated within the first few minutes of the album on the track “Compendium”. The song starts with a light guitar riff but is soon enough joined by the bassist, escalating into a heavier feel that surrounded me with a thick, inescapable wall of sound. DiSalvo allows the riff to repeat itself before moving on to other parts of the song (including a riff that bears extreme resemblance to Led Zeppelin’s Immigrant Song, which works surprisingly well in context), but in no way does the repetitious nature of the album ever become tedious. Lore is spiced up with surprisingly melodic leads and dreary atmospheric passages sprinkled throughout. Enhancing the quality of the music is the production. I don’t have any complaints with Lore‘s mixing or mastering. The guitars, drums and bass are distinguishable from one another, blending together to immerse me fully. Everything sounds, in a word, thick. It’s impossible not to feel the weight that the instruments produce. The vocals aren’t mixed particulary loudly as they take somewhat of a backseat; much of the music on Lore is based purely around mind-altering riffs, and I wouldn’t have it any other way. Lore is a beautifully executed record that embodies what stoner doom is all about; slow pacing, a massive soundscape and a boatload of hypnotic riffs. I’m excited to see where Elder goes next. It’s going to be hard to top Lore, but if they capture even a fraction of what makes this album as good as it is, I’ll be satisfied. Look into this one if you’re a fan of Sleep, marijuana, or quality metal in general.